The House defied Gov. Deval Patrick Monday and delivered a narrowly veto-proof, 108-51 majority behind Speaker Robert DeLeo's proposed 25-percent increase to the state's five-cent sales tax. Debate on the House floor became emotional at times, with lawmakers arguing over whether more harm would be done to the state by a higher tax or by preserving the House budget committee's cuts. [Rep. Daniel Webster, R-Hanson] said the state should not hit up taxpayers to sustain Beacon Hill's urges. "We are asking them to pony up more because we have an insatiable appetite to spend, spend, spend," said Webster. House lawmakers approved a sales tax hike last night by a veto-proof margin, capping a dramatic showdown with Governor Deval Patrick after he threatened to veto the broad-based tax increase. Patrick opposes the plan and sent an ultimatum to all 200 members of the Legislature yesterday afternoon, promising to veto the increase unless lawmakers first enact transportation, ethics, and pension law changes he has sought. A bruising budget brawl on Beacon Hill ended with House lawmakers approving a sales tax hike, as House Speaker Robert DeLeo won a potentially veto-proof margin over Gov. Deval Patrick’s objections. The House voted 108 to 51 to raise the state sales tax 25 percent to 6.25 cents on every dollar, casting their ballots at 11 pm before calling it a night. The Senate still must approve the tax boost before it goes to the governor. The new speaker only narrowly secured a two-vote margin to override Patrick’s threatened veto, and had to sway freshmen lawmakers to carry the day. The advocates for social services spending - also well organized, but louder - said they did not particularly care what taxes were increased to save programs. Judy Meredith, a longtime human services lobbyist, also took a fresh approach with onemassachusetts.org, a website that urges residents and advocates to contact their legislators and organize their friends through Facebook and Twitter. "We're doing a virtual rally," Meredith said. Business groups yesterday rallied around Gov. Deval Patrick’s threatened veto of a proposed sales tax by the Massachusetts House. “We need to have reform before any new revenues,” said Brian Gilmore, a spokesman for the Associated Industries of Massachusetts. He said AIM was “pleased” by Patrick’s threat to veto a sales tax hike to 6.25 percent from 5 percent without any reforms within the transportation system. “We’re thankful for the governor standing up for consumers and Main Street merchants,” said Jon Hurst, president of the Retailers Association of Massachusetts, which yesterday warned that thousands of jobs could be lost if consumers flock to no-sales-tax New Hampshire to buy items. It would warm our hearts to be able to anoint Gov. Deval Patrick as the new champion of beleaguered taxpayers, given his very public break with lawmakers yesterday over an increase in the sales tax. Yes, lawmakers have been slow to act on reforms and good for the gov for calling them out. He’s also right to question a sales tax hike. Unfortunately his goal in prodding lawmakers to act is so that he can justify his own “targeted” tax hikes, putting those same jobs and those same taxpayers at risk. Yes, Gov. Deval Patrick - together we can! If there were any real taxpayer advocates, we wouldn’t have to count on Governor Gas Tax to get our backs. But we don’t have any real friends. All we’ve got is the Massachusetts Taxpayers Foundation. Calling Michael Widmer’s MTF a “taxpayer organization” is like calling a pride of lions “gazelle rights advocates.” In order to give DeLeo cover, they’ve come up with this spin that Massachusetts has “the lowest sales tax of the 45 states” that collect it. A 10-second Google search found 16 states with sales tax rates lower than our 5 percent. North Carolina’s is 4.5 percent, for example, and Colorado’s is 2.9 percent. How can they call it “lowest in the nation?” By calculating the sales tax adjusted for income. According to MTF, since we earn more, our 5 percent is lower than Colorado’s 2.9 percent. The Massachusetts Miracle in the late '80s, with annual revenue growth averaging 13 percent from 1984 to 1987, was followed by the high-tech bubble burst. Revenue growth slipped to 4.3 percent in fiscal years '88 and '89, and declined by 4.4 percent in 1990. We have reached the end of the inexorable pendulum-like cycle of government change, from the social investment of Governors Sargent and Dukakis, to the fiscal conservatism of Weld/Cellucci/Swift/Romney, and now back to the demand for social investment under Patrick. New revenues are needed, and that means taxes need to be increased. Across the Commonwealth, employers are making painful decisions to curtail expansion plans, defer critical expenditures, and drop product or service lines to focus on core businesses. AIM surveyed 145 Massachusetts employers during February and found that 46 percent had conducted a layoff or were preparing to do so. They are turning to pay freezes (55 percent), reduced work hours (42 percent), and altered staffing plans (86 percent). A significant number are also instituting a salary reduction program, and many are modifying their retirement plans. Three-quarters are seeking ways to stave off increases in employee contributions to health-insurance premiums - which also involves hard decisions. The state has failed to address, even in good times, its structural budget deficit; and rather than reduce fiscal uncertainty it has transferred it to taxpayers. In 2007, a bipartisan commission that studied the transportation problem recommended a higher gas tax, as well as moderate toll increases and MBTA fare hikes, to raise a total of nearly $20 billion in unmet needs over the next two decades. If state lawmakers are serious about reforming public pensions, they will close this tap before it pollutes the public's trust in government any further. In his Boston Globe op-ed column today defending higher taxes, Steve Crosby wrote: "From 1991 to 2008, program spending increased from $9 billion to $28 billion, more than double the rate of inflation ... Typically, governments spend at least all that they collect ... New revenues are needed, and that means taxes need to be increased." "We're urging legislators to raise significant revenue in the fairest way possible," crowed Carl Nilsson, spokesman for the Gimme Lobby. Translation: Hike taxes through the stratosphere any way you must, just gimme more. Judy Meredith, leader of the Gimme Lobby's ONEMassachusetts, called the $900 million sales tax hike "neither adequate nor balanced," and asserted that it wasn't enough -- because More Is Never Enough (MINE)! "I stand with the children of the Commonwealth," said uber-liberal Rep. Ruth Balser (D-Newton). You just knew they had to "do it for the children" sooner or later, right? The Boston Globe reported: "Transit riders have had a harder time getting lawmakers' attention than motorists who pay tolls to drive on the Pike.... In 2000, the T began taking in one cent of every taxable dollar in the state, a system designed to give the authority enough money to pay its own bills forever and cover its existing debt." Do they ever stop to consider-- dare I say appreciate? -- that motorists also pay the gas tax, which also subsidizes their cheap ride? And Michael Graham has sure got the so-called Massachusetts Taxpayers Foundation's number! As we've been saying for years, Michael Widmer and his MTF do and have done nothing but run cover and interference for the tax-and-spend crowd. 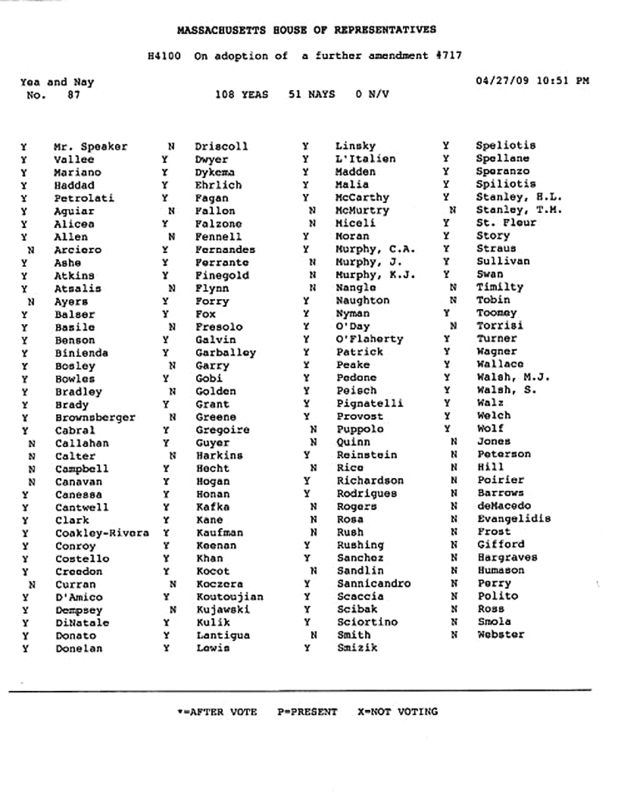 Last night the House voted 108-51 to hike the state sales tax by 25 percent, for a start. The House returns today "to discuss additional revenue amendments," according to the State House News Service. Gov. Patrick delivered a letter to each representative warning that he'd veto a sales tax hike, causing the House leadership to recess the session and bend arms to get a veto-proof majority before taking the vote, late last night. First term Rep. Jonathan Hecht (D-Watertown) "said he had been elected last September without facing a Republican opponent," The State House News Service reported. 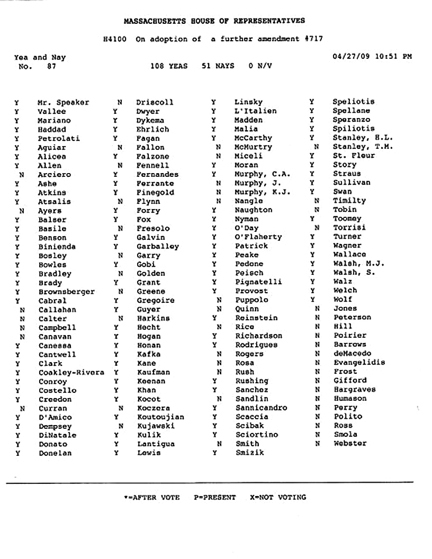 "'Perhaps that will change after this vote,' Hecht said, drawing laughs from colleagues." They laugh in our faces, the voters -- their employers -- toss us the middle-finger Beacon Hill salute! This must change come the 2010 elections! It's past time they learn to respect us, the people who allow them to represent us from time to time. How did your alleged representative vote? Was he or she one of the soon to be notorious 108 who think you're not taxed enough and don't care what you think anyway, or one of the 51 who stood up for us taxpayers? The 108 may be notorious today, but we intend to make this endangered species extinct in the next election. After several hours of vote-counting and tense negotiations with members reluctant to endorse a broad-based tax hike that House officials would bring in $900 million next fiscal year, DeLeo carried the first major test of his speakership, in the face of Patrick's last-minute threat appeared to imperil the increase. The package, which drew 35 Democratic opposition votes, calls for $275 million to fund transportation spending and $200 million to blunt the $424 million local aid cut in the House budget committee draft. House leaders said that even with the new revenue, still subject to Senate approval, their budget still relies on $1.2 billion in cuts to help close an estimated $3.6 billion budget gap next year. Patrick, who has proposed a battery of new taxes left ignored by the Legislature, sought Monday to position himself as opposed to new taxes until significant reforms in transportation, ethics, and pension rules had become law. His early-afternoon letter to the entire Legislature appeared to take senior lawmakers by surprise. "Honestly, I haven't even read the letter," House budget chief Charles Murphy told reporters after the vote, which closed at 10:58 p.m. "I heard about the letter. Some people weren't terribly happy about it. But the fact of the matter is, we've got 160 people who were elected individually in their own districts making their own adult decisions, and I would suggest it was a responsible decision, based on the circumstances." Murphy added, "The governor, you know, he can do whatever he does. That's great … The governor's doing his own thing." Patrick's threat Monday was his first outright promise to veto a sales tax bill unless lawmakers ratify his reform proposals as well, although he said last Friday he was "very skeptical of a sales tax," which many see as regressive because it does not factor income levels. Patrick has urged a 19-cent gas tax hike, which would generate just under $500 million per year, according to estimates, to help close a projected 20-year, $20 billion transportation infrastructure deficit. House leaders said the sales tax bump would likely preclude a gas tax vote. The first day of House budget debate was perhaps the tensest between the House and Executive Branch since DeLeo took the gavel in January, leading to a closely watched roll call vote on the speaker's proposal two minutes before midnight. Rep. Frank Smizik (D-Brookline), noting that he agreed with Patrick's preference for a higher gas tax over a higher sales taxes, said Patrick was reprising his campaign rhetoric pillorying Beacon Hill mismanagement and turning lawmakers into targets of his promised reelection bid. "I think he's trying to run against us for next term," Smizik, an early Patrick backer in the 2006 campaign, told the News Service. "I think he's doing it again." Patrick on Monday forwarded to his political email list the letter he sent earlier in the day to the 200 members of the Legislature threatening to veto a sales tax increase unless there was satisfactory action on pension, transportation, and ethics reforms, the latter of which he said has seen "no action at all" in the Senate. In the forwarding message to his supporters, Patrick wrote, "I ask that you forward this email to all of your friends, family, and colleagues so that they too can be informed of this very important issue facing our state." DeLeo has said the House would take up next month Patrick's legislation allowing municipalities to raise their own taxes on meals, lodging, and telecommunications equipment. A spokesman for Senate President Therese Murray said she would not inject herself into House deliberations. "Everything with the exception of the income tax is on the table," said the spokesman, David Falcone. "This is the time for the House to finalize its budget recommendations, and we're going to respect that process." Pressed for Murray's preference, Falcone said, "She hasn't indicated what the preference would be, if any. Obviously, we're looking at everything." The 108-vote total behind the sales tax came after hours of representatives responding to DeLeo's invitations to discuss the vote in his office. The House needs two-thirds of the members to override a gubernatorial veto. With former Speaker Salvatore DiMasi's seat vacant and the chamber's membership number 159, securing a veto override would require 106 members. By the time the budget works its way back to the House, that seat will likely be filled, meaning the override threshold would rise to 107 votes. "I stand with the children of the Commonwealth," said Rep. Ruth Balser (D-Newton), arguing the new state revenues would prevent deeper cuts to human services and education. "I'm not going to ask them to tighten their belts." Rep. Matthew Patrick (D-Falmouth) said,"We have gone beyond cutting the budget to the bone and we are now contemplating complete amputation of programs." Opponents of the tax increase said the impact on the state's economy would be devastating, and pointed to a Beacon Hill Institute report that suggested 10,000 job losses under the higher rate. "It is the mom-and-pop stores that are going to bring us out of the recession, and they're the ones that you're going to go after," said Rep. Bradford Hill (R-Ipswich), who held up pictures on the House floor of business that had closed recently in his district. Republicans praised the $27.44 billion Ways and Means draft as prudent, and decried what they said was a last-minute proposal that had not undergone the legislative vetting process. Rep. Daniel Webster predicted that boosting the budget's bottom line would result in midyear spending reductions, like those the state has undertaken in three rounds this year. Webster said the state should not hit up taxpayers to sustain Beacon Hill's urges. "We are asking them to pony up more because we have an insatiable appetite to spend, spend, spend," said Webster (R-Hanson). Some advocates said the sales tax proposal was improperly designed. Judy Meredith, a human services advocate leading a push for significant tax increases, called the House plan "neither adequate nor balanced," arguing that the revenue would not be enough and that lower-income residents would be disproportionately affected by the higher rate. Members joked about the electoral risks in backing higher taxes. Endorsing the tax hike in his maiden speech, Rep. Jonathan Hecht (D-Watertown) said he had been elected last September without facing a Republican opponent. "Perhaps that will change after this vote," Hecht said, drawing laughs from colleagues. Several categories of goods are exempt from the sales tax, including food, clothing, periodicals, event tickets, utilities such as gas or electricity, residential phone services, transportation, and services like accounting and legal assistance, and car repairs. The House returns Tuesday to discuss additional revenue amendments, then take up local aid proposals. House Speaker Robert A. DeLeo won his first political victory with the 108-to-51 vote, persuading lawmakers to sign onto his plan to increase the sales tax from 5 percent to 6.25 percent. The vote also heightens the tension among top Beacon Hill Democrats, who have had sharp disagreements over how to solve the state's budget crisis. "We've got 160 members . . . making their own adult decisions," Representative Charles A. Murphy, the House chairman of the Ways and Means Committee, told reporters after the vote. The governor, he added, "can do whatever he does. That's great." The governor sent his threat in a letter as the House was preparing to debate DeLeo's plan, which could raise $900 million in new revenue to help avoid steep budget cuts. Patrick said he did not believe that the public will support the House plan without bigger changes on Beacon Hill, including curbing pension abuses and tightening ethics codes. "I don't believe that we can go to the public and ask for any broad-based tax increase unless we get meaningful outcomes on the reform measures that are pending," Patrick told reporters yesterday afternoon. It was a rare moment of open discord between party allies. It forced DeLeo and his leadership team to retreat behind closed doors through much of the day to muster 107 votes, the two-thirds required for an override. Senate leaders, who also would need to sign onto the House's tax increase, were conspicuously silent on the subject. Senate President Therese Murray declined to comment. Her spokesman repeated Murray's previous comments that she has not ruled out any tax increase, except for a hike in the income tax. Several lawmakers accused Patrick of posturing in advance of a 2010 reelection bid. "I think this is him kicking off his campaign," Representative David Flynn, a Bridgewater Democrat, said in an interview. "It's usually the thing to do, run against the Legislature." Patrick's veto warning was part of an eventful day full of political intrigue, behind-the-scenes negotiations, and Democratic infighting. The chants of protax advocates thundered through the State House corridors, even as lobbyists, hoping to preserve funding for various causes, stood in the hallways hoping to catch a few minutes with lawmakers. At one point Patrick tried to avoid reporters and slip into his office by an alternate, fourth-floor office, only to be tracked down. The debate was the first major political test for DeLeo, who took over from Salvatore F. DiMasi in January. DeLeo's promise to hold a free and open debate on the House floor was jettisoned as, in private meetings, he sought to persuade Democratic lawmakers to buck the governor. Late in the afternoon, DeLeo still had not found enough votes, and the House recessed for several hours, according to Democratic House members who did not wish to be identified. Debate on the issue began around 8 p.m. and lasted for about three hours. DeLeo also did not emerge to make any public statements, even after the vote last night, temporarily ceding the public debate and the strategic advantage to Patrick. "I've always been about reform before revenue," Patrick told reporters yesterday. "But it's more than that. It's change before revenue, and I want that change. And so, by the way, do the people of the Commonwealth." DeLeo wants to dedicate about $275 million of the new revenues that would be raised by the sales tax increase to transportation. Under the speaker's plan, that would avoid the need for a gas tax increase of 19 cents per gallon proposed by Patrick. DeLeo's plan would result in just half the revenue, however, dismaying transportation advocates, who say it is not enough to solve chronic transportation funding problems. In recent days, Patrick has grown increasingly impatient with the Legislature, chiding lawmakers for not adopting his transportation changes, separate pension and ethics changes, and for ignoring his proposal to tax candy and alcohol. With his new tactics, Patrick predicted yesterday that "we will get to a good result." The governor surprised many lawmakers by e-mailing them his letter at 12:31 p.m., just before they went to the House floor to debate the $27.4 billion budget. The letter was later sent to his political supporters through his campaign committee. "I ask that you forward this e-mail to all of your friends, family, and colleagues, so that they too can be informed of this very important issue facing our state," Patrick wrote in the e-mail. Two of Patrick's possible gubernatorial rivals oppose the sales tax increase. "While I recognize the need for revenue, raising taxes of any kind during a recession is a bad idea," Treasurer Timothy P. Cahill, who has not ruled out challenging Patrick, said in a statement. Christy Mihos, who has declared he will run as a Republican, also opposes increasing the sales tax. “It’s clear (Patrick’s) trying to scuttle the sales tax because he wants a gas tax instead, and there isn’t enough support to pass a 19-cent gas tax,” said state Rep. Joseph Wagner (D-Chicopee), chairman of the transportation committee, before the vote was taken. DeLeo - whom one lawmaker said was trading earmarks for votes in an effort to avoid a politically embarrassing early budget loss - had just more than 100 votes just hours before the final tally, said several lawmakers close to the negotiations. Patrick delivered a letter to all 200 lawmakers right before the House began to debate DeLeo’s plan that dealt a roundhouse political blow to the new speaker and left his leadership team reeling as they began the first day of budget deliberations. While lawmakers expressed surprise, Patrick briefed both DeLeo and Senate President Therese Murray of his intentions Sunday, and reached out to them again yesterday before he dispatched the letter. DeLeo’s hike would raise an additional $900 million, of which $275 million would go to fund transportation needs and $200 million would go toward cities and towns. Patrick, who wants a 19-cent increase in the gas tax as well as higher levies on booze and candy, said he would reject any budget that doesn’t include them. “I don’t believe that we can go to the public and ask for any broad-based tax increase unless we get meaningful outcomes on the reform measures that are pending,” Patrick told reporters yesterday afternoon as House lawmakers remained in deep negotiations. Some rank-and-file members were annoyed at Patrick’s missive, which he later forwarded to supporters via his political committee. “I’m not going to get all huffy about it, but I’m not impressed either,” Provost said. Several lawmakers, some of them Patrick supporters, said the governor’s actions indicate he’s running for re-election, once again positioning himself as a reformer against the Legislature. Lobbyists lingered in the State House yesterday, stopping lawmakers in the halls and urging them to reject tax hikes. On the other side of the issue, advocates for the homeless and mentally ill marched with union officials, filling the corridors with chants of "Raise Revenues! Stop the cuts!" The targets of their fervor: state representatives who began debating yesterday whether to help solve the state's recession-induced budget crisis by increasing the state sales tax to 6.25 percent from 5 percent. "We had perfect attendance of all the special interests," said Representative John Quinn, Democrat of Dartmouth. Business groups, restaurants, healthcare companies, and unions were all represented. The state's retailers argued against the sales tax hike, which represents a 25 percent increase in the tax, saying it would be disastrous for businesses crippled by the recession and would send customers fleeing north. "Consumers will have other options," said Jon Hurst, president of the Retailers Association of Massachusetts, which represents 3,100 businesses. "They can go to New Hampshire or go online, where nothing is taxed. "This doesn't make common sense," he said. "We're urging the governor to veto this." James Klocke, executive vice president of the Greater Boston Chamber of Commerce, said his group's members were lobbying against a sales tax hike, instead favoring an increase in the gas tax of 25 cents a gallon. "We think the most pressing financial need is on the transportation front," Klocke said. "The gas tax would be dedicated to both the prevention of a toll increase and fixing the MBTA's finances." The House's sales tax plan was not the only subject of intense lobbying, as House members were reviewing hundreds of amendments filed by individual lawmakers. The Massachusetts Restaurant Association, for example, came to oppose moves to allow local communities to impose meals taxes. "I don't want to see restaurants singled out," said Peter Christie, the group's president. "You'll see me kicking and screaming if they go to a local-option tax." "We're not calling for a specific proposal," said Carl Nilsson, spokesman for Neighbor to Neighbor, a group of 20 organizations that represent low-income families. "We're urging legislators to raise significant revenue in the fairest way possible." The registered lobbyists spoke in hushed tones in the hallways outside the House and Senate chambers, texting on their cellphones during lulls in the conversation. Many refused to say whom they represented. "I have clients who are concerned about the safety net," said one, who did not want to be quoted by name. "They're concerned about what is happening. All you can do is try to get in front of the decision-makers and make your case." James Barry, a legislative agent for the Boston Police Patrolmen's Association, said he was looking for money to restore funding for the Quinn Bill, a program that boosts the pay of police officers who receive college degrees. The House budget cut $52 million for the program. The Greater Boston Chamber of Commerce, which earlier this year endorsed a 25-cent gas tax, said the governor was right to “seize the opportunity” for reform. The state desperately needs to change its budget, transportation, pension and health-care agencies and practices before it starts raising general taxes, said Jim Klocke, executive vice president of the chamber. House leaders have rejected a gas-tax increase, which Patrick supports, and favor a sales tax hike as a better way to help plug a huge state deficit. It’s just too good to be true. Sure, just as the House was beginning debate on the fiscal 2010 budget (and that 25 percent sales tax hike being pushed by House leadership) Patrick circulated a letter to lawmakers in which he vowed a veto. “I have deep reservations about imposing a higher sales tax on people during these difficult economic times, especially at the risk of costing the commonwealth jobs and at a time when we can least afford that trade-off,” the governor wrote. Yes, Patrick vowed to veto a sales tax hike - but largely because lawmakers have so far failed to OK all of the other tax hikes he has proposed to help balance the budget and even to finance new programs. That includes a 19 cent hike in the gas tax, along with new levies on booze, candy and sugary drinks. The governor says lawmakers haven’t yet done enough to embrace the administration’s “reform” agenda, so he will not consider any new revenue until pension, ethics and transportation reform are fully enacted. Heck, it sorta sounds like “reform before revenue” . . . But just substitute the word “gasoline” for “sales” in that quote above, and Patrick’s pitch begins to fall apart. You keep having days like you did yesterday, throwing down on the DeLeo Tax Hike Express, and we can keep “reform before revenue” alive. Bobby and his Good Ol’ Boys (“We’ve got both kinds of legislation - taxing and spending!”) are singing and “cha-ching”-ing the same old song: Show me the money. I expected that. What I didn’t expect was for you to call them out. Did you really write that, Governor? It’s so out of character. So, well . . . gubernatorial. And I mean that in a nice way. Look, I know you have a stack of other taxes you want to raise - in particular a 19-cent-per-gallon punch in the face of every driver in Massachusetts. And if the Legislature does the usual difference splitting - dump the reforms but keep the tax hikes - I have doubts that you’ll hang tough. But yesterday was a good start and on behalf of every Massachusetts taxpayer, I hope you prove me wrong. And it’s about time somebody did something on behalf of the taxpayers. We keep getting told, for example, that the sales tax hike is only “a penny or two.” But as the Massachusetts Retailers Association points out, a 6.25 percent sales tax will cost us an additional $900 million. That’s 90 billion pennies. The “up the sales tax” crowd never talks about the gross sales tax cost. DeLeo’s proposed hike would take more than $4 billion out of our pockets. Not only is that real money, but as every retailer in a border town will tell you, that’s $4 billion more than they pay in New Hampshire. This is the economic equivalent of calculating the size of my budget by measuring my wallet. Using Widmer’s “logic,” the cheapest steak in town is at Abe & Louie’s and every Boston bargain hunter drives a BMW. When the bad guys are working that hard to raise our taxes, what chance do we taxpayers have? That’s why I’m cheering you on today, Governor. We’re still going to get the shaft, but if we can get some meaningful reform, some fundamental change - bringing pensions into line with the private sector and seriously cutting the transportation bureaucracy - it won’t have been entirely in vain. And that, unfortunately, is what passes for a taxpayer victory in Massachusetts. As state policymakers wrestle with the financial crisis, it's worth remembering earlier fiscal crises and the history that got us here today. That was a real financial crisis. Moreover, the Commonwealth had no rainy day fund; it had to float bonds to cover its day-to-day operating expenses; its pension obligation was 61 percent unfunded with a $12.2 billion liability, on an annual budget of $9 billion; and it had to borrow from the federal government to meet its unemployment compensation obligations. That additional $3 billion could certainly solve today's fiscal problems. Were those tax cuts a bad idea? Artificial savings at the expense of a structural deficit? Not at all. From 1991 to 2008, program spending increased from $9 billion to $28 billion, more than double the rate of inflation; $16.5 billion was deposited in the state pension fund, reducing the unfunded liability from 61 percent to 31 percent; over $3 billion was contributed to the rainy day fund from budget surpluses; and tens of billions of dollars stayed in the pockets of Massachusetts taxpayers and businesses. Typically, governments spend at least all that they collect. The enormous revenue growth of the mid-'80s led to no savings, a huge unfunded pension liability, and vastly increased spending. If the tax cuts had not occurred, the Commonwealth's spending would likely have matched all the tax revenue the state collected. Nearly two decades of tight fiscal policy has been an essential brake on state spending, and an appropriate response to the legitimate concerns of personal and business taxpayers about profligacy in state government. But times have changed. Service delivery is genuinely compromised in vital areas of government. There is also a structural deficit that probably cannot be made up with spending cuts that the public will support. We have reached the end of the inexorable pendulum-like cycle of government change, from the social investment of Governors Sargent and Dukakis, to the fiscal conservatism of Weld/Cellucci/Swift/Romney, and now back to the demand for social investment under Patrick. New revenues are needed, and that means taxes need to be increased. It should not occur until pension and health costs for state employees are brought to standards that are sustainable and fair in today's environment. It should be done with shrewd phasing, and with full utilization of the stimulus and rainy day funds. Two new taxes seem obvious. Cities and towns deserve the right to increase meals and hotel taxes at their own option. The gas tax has decreased due to inflation every year since 1991. Simply matching inflation would increase the gas tax from $.21 per gallon to $.34. An additional $.12 would enable a real investment in stabilizing the T and improving our transportation infrastructure, with an environmentally strategic tax on carbon. But that is not enough, given the public's commitment to widely available healthcare, quality pre-K-12 education, and a public higher-education system accessible to all. Raising the sales tax from 5 cents to 6 cents on the dollar, with certain exemptions, would raise about $750 million. With appropriate reforms and discipline, that should be enough for the Commonwealth to meet its legitimate social obligations. It would also still leave a $2 billion tax-cut legacy. Steve Crosby, who was secretary of administration and finance for Governors Paul Cellucci and Jane Swift, is dean of the McCormack Graduate School of Policy Studies at UMass-Boston. Associated Industries of Massachusetts, the state's principal employer organization, has found itself opposing proposals to raise the gas tax and sales tax. Its position is that set forth by Governor Patrick yesterday in a letter to the Legislature: "Before we consider any broad-based tax increases, we must first regain the public's confidence in government's ability to steward public funds wisely." AIM really does believe in "reform first" - its members live it every day. Private-sector employers - and employees - simply do not see state and local government facing up to choices like this. Of course, cutting public budgets is unpleasant work, and some decisions - to preserve investments in education, for example - have been commendable. Pay has been frozen and furloughs imposed. But we have seen too little reconsideration of core priorities, too little structural reform, too much resistance to reining in health insurance costs and to reforming pensions (at a time when the benefits prevalent in the public sector have become virtually unsustainable in the private sector). What we have seen, beyond the bobbing and weaving, is some egregiously bad fiscal policy, notably a huge increase in business taxes that has increased the Commonwealth's dependence on highly cyclical revenues and made its finances more vulnerable to recession, while damaging its economic competitiveness. The state has failed to address, even in good times, its structural budget deficit; and rather than reduce fiscal uncertainty it has transferred it to taxpayers. We in the business community are not simply naysayers. We have supported judicious tax increases in the past. We recognize that the Commonwealth may need new revenues - among other things. We believe, however, that increasing revenues should be a last resort. A gas tax increase, as proposed by the governor, can make sense, but only if it is tied to reform and to a restructuring of state transportation agencies. (Indeed, until we know the structure and how the bonding works, we cannot know what kind of revenue is needed.) A sales tax increase, as the governor says, can be considered only after "final and satisfactory action on the several reform proposals" now pending. What is at issue here is the credibility of government - and not just within the business community. The governor says that the people of Massachusetts deserve "real reforms and real change"; legislators are evidently well aware of (shall we say) a limited tolerance for tax increases among their constituents. The public, too, wants reform first. Richard C. Lord is president and CEO of Associated Industries of Massachusetts. The House plan to raise the state sales tax could create some short-term relief for commuters anxious about toll hikes and MBTA fare increases in the coming year, but it would do little to halt the larger crisis that has made transportation a top issue on Beacon Hill, advocates and observers say. "If the public thinks that, 'Oh, this sales tax is going to solve all the problems,' it won't," said Eric Bourassa, a public transit advocate for the Massachusetts Public Interest Research Group. "It might improve the short-term problems, but it might just push them off into the future." The House bill would generate about $275 million a year for transportation, but would leave the specifics on how it will be spent to future debates, which would probably pit transit riders, turnpike users, and other interests against each other. So far, top lawmakers have indicated they are most eager to prevent about $100 million worth of toll increases on the Massachusetts Turnpike that would double tolls to $7 for cash-paying passenger cars at the Sumner and Ted Williams tunnels and raise them substantially elsewhere. Transit riders have had a harder time getting lawmakers' attention than motorists who pay tolls to drive on the Pike. Still, the remaining transportation money in the House plan, if dedicated to the T, could probably halt, or at least reduce, a fare hike of as much as 30 percent, as well as severe service cuts that threaten to eliminate weekend commuter rail runs and reduce the frequency of service on almost every other bus and subway route. The Massachusetts Bay Transportation Authority is officially projecting a $165 million deficit next budget year, but Daniel A. Grabauskas, the general manager, said last week that the gap is expected to grow larger than that by July 1, when the budget year begins. Even if the state stretches the new sales tax money enough to cover that growing deficit, the bigger problems - most notably, the MBTA's $8.2 billion debt load - would remain unsolved. The state would still have to borrow $135 million every year to pay for its basic highway maintenance costs. It would have nothing to give regional bus systems outside Boston or to cover $68 million a year in needed repairs on the turnpike west of Route 128. "It's a start," said Marc Draisen, executive director of the Metropolitan Area Planning Council. "It's not the end." Draisen praised House Speaker Robert A. DeLeo for cobbling together votes to help transportation in what most agree is a very difficult political environment, given the large volume of state needs and the weakened economy. But the same poor economy that is hitting taxpayers and government agencies could diminish how much money the House plan generates, if spending continues to decline. MBTA managers know that problem well. In 2000, the T began taking in one cent of every taxable dollar in the state, a system designed to give the authority enough money to pay its own bills forever and cover its existing debt, then more than $2 billion. But even the most conservative sales tax projections, of 3 percent growth per year, were too optimistic. In the previous decade, revenue from the sales tax had grown 6.5 percent a year. But after 2000, it grew an average of 1 percent a year, and the T went further into debt as it paid for expansion projects required to mitigate the Big Dig's environmental impacts. If the T plugs next year's operating deficit, it will still need to borrow about $200 million a year to replace old train cars, rebuild aging stations, and complete other large-scale repair programs. In 2007, a bipartisan commission that studied the transportation problem recommended a higher gas tax, as well as moderate toll increases and MBTA fare hikes, to raise a total of nearly $20 billion in unmet needs over the next two decades. The chairman of that commission, Stephen J. Silveira, said yesterday that the members intentionally chose the gas tax and other user fees so the public would see a direct connection between transportation costs and services, rather than simply another tax. Using more sales tax dollars for transportation would end that approach. "OK, I go and I buy my new flat-screen TV, and I pay an extra $25," he said. "And, what, $6 of that is for transportation?" Rage over extravagant pensions has reached the quasi-public Boston Redevelopment Authority, where a consultant with about 50 years of service at the agency has had his contract terminated over charges of double-dipping. Paul McCann, the former executive assistant to the BRA director, retired in 2005 with a $97,000-a-year public pension. But he never really left. Last year, he earned $162,000 in consulting fees on top of his retirement pay despite a state law prohibiting retired employees from collecting more in total income than the original position pays. McCann says the income limits do not apply to the BRA, which is not a line item in the city budget. But the state Public Employee Retirement Administration Commission, which oversees 100 local retirement boards, says the income limits do apply. In limited circumstances, it can make sense for agencies to rehire retirees with special skills on temporary contracts. But paying McCann more than $100 an hour for up to 25 hours per week raises serious questions about the quality of succession planning at the BRA. It raises even more questions about a lack of oversight at the BRA. Minimally, Mayor Menino should give the Boston Finance Commission, which reviews no-bid contracts, the same power to oversee the quasi-public authorities that it uses to keep consultant contracts in check at the school, police, and other city departments. Obscure, decades-old decisions from the attorney general's office may also be giving some retirees the go-ahead to milk the system. If state lawmakers are serious about reforming public pensions, they will close this tap before it pollutes the public's trust in government any further.